The junior surf camp accommodation part of a public camping place. “El Rosal” is surrounded by beaches and mountains in San Vicente which directly give you a feeling of vacation. The sandy beaches near of the camping place do not just offer a nice spot for surfing, but also for windsurfing, waterskiing and other watersports. 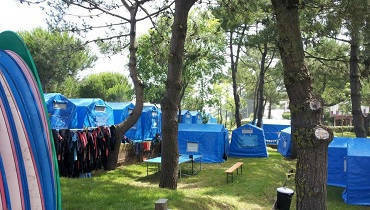 The junior surf camp accommodation will be in tents. But don’t worry, you can enjoy a certain camp-luxury, because you stay in twos in a spacious tent for 4 persons. So you have enough space to spread yourself out and to install yourself, during your stay. Even if we offer the tent, you have to bring your sleeping things, like a pillow, sleeping bag, insulating underlay, air mattress and sheet by yourself. But if you don’t want to carry such a mattress all the way to spain, we offer you to book a real mattress for only 10€ extra. You can book this mattress per comment in the booking. The payment will be on-site. 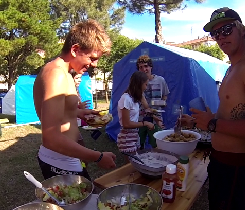 In the kitchen-tent, you can eat as much as you want for breakfast, lunch and dinner to have enough energy for surfing. Our camp cook always prepares varied and tasty food, together with the team. For that, you should bring your own dishes!! In our large dinner-tent we have breakfast together and also the dinner takes place there. 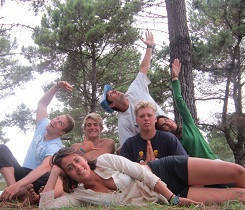 The junior surf camp accommodation offers also a surf-tent. There you will find the entire equipment like surfboards, wetsuits and leashes. During the day you can simply relax, listen to the music, watch out a surf-movie, or just have a small talk with the other camp members, in our chill out-tent. Otherwise, after surfing you can let off steam at the two ping pons tables in our camp, or at the beachvolleyball field. As required – we also organize tournaments and you can give your utmost to win. 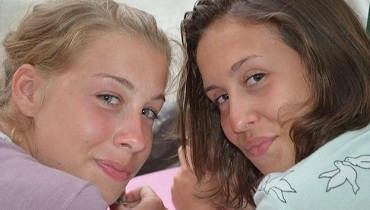 You use the sanitary fittings of the camp which are equipped with showers, toilets and washbasin. Of course, hot water is included in the price and available 24 hours a day. We looking forward to having the pleasure to welcome you at our junior surf camp accommodation and hope you are going to have an awesome time with us!